I was contacted by the assistant costume designer by phone approximately 2 years before the movie was released. I was asked if I could make a meeting in New York with Gloria Gresham, the costume designer, the next week. We met and discussed the needs they had for the look of the film and how Catskill Mountain Moccasins could meet those needs. At the end of the meeting Gloria said she liked our work and she would get back to me in a couple of day's, after she ran it by the director and producer. She called me and said I needed to be in Portland, Oregon the following Monday and that I should expect to be there of a few day's. The next Monday we had a huge snow storm on the east coast and most of the airports were shut down. I somehow managed to reroute myself and made it to Portland on time. What was supposed to be a few day's turned into 2 weeks. What was going to be a few pairs of moccasins turned into 23 pairs plus one pair for William Friedkin, the director. I would do the fittings and overnight them to Lynn who dropped everything and would make them them in the next couple of days and overnight them back. We delivered every pair on time and with perfect execution. Working in the film industry was, and will hopefully be again, an incredibly rewarding experience. I so much enjoyed the total dedication all the people involved in the film displayed and the respect that I was shown for the work we do. Not to mention how totally cool it is to see our work on screen. The moccasins that Benecio wore (top image) are 4 button buffalo moccasins with a natural trim and Vibram sole. The cost for his moccasins is $587.00. 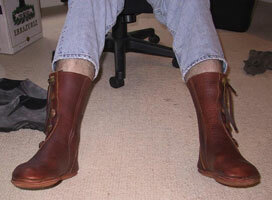 The moccasins that Tommy wore (4th image down) are basic 5 button buffalo moccasins with our standard sole. The cost for his moccasins is $509.00. Click on the images on the right to see enlargements. 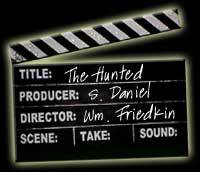 And take a look at the trailer for "The Hunted."